Thin, light basic crepe recipe which can be used to create a savoury or a sweet dish. 1. Using one egg, crack open the top only so that just a small part of the egg shell breaks. 2. Pour the egg into the mixing bowl and put the larger piece of the egg shell to the side to use later on. 3. Crack open the other eggs as you normally would and add them to the bowl. 4. Using your whisk, best the eggs as much as you possibly can, for at least 5 minutes. 5. You should notice small bubbles form on top of the eggs. 6. Get the egg shell which you put aside earlier, and wash it out. 7. Fill the egg shell with water and add this to your eggs. Repeat 4 times. 8. Mix your eggs once again. 10. Mix once again for another 3 minutes! 11. Add a portion of the flour and mix well. 12. Add another portion of the flour if the mixture is too dense. 13. You will need to judge the texture as it needs to be nice and smooth without being runny. It has to have an element of density to it. 14. The amount of flour you need will be based on the size of the egg you use and also the freshness as in Italy, I used to use farm fresh eggs and they were huge! 15. Using a large deep spoon, scoop up the mixture and pour it back in, to see if you are happy with the result. 16. Now, get your saucepan and place it on the stove top at a medium heat. 17. Pour some extra virgin olive oil into the pan and spread it around evenly. 18. Let the oil heat up and then roll your saucepan so that the oil covers the base and the edges and remove any excess oil. 19. Using a paper towel remove any remaining excess, making sure you leave just a small amount of the oil lining the pan. 20. You will see some small bubbles on the bottom of the pan and this will help stop your crepe from sticking to the bottom! 21. Put the paper towel to the side as you can use it later. 22. 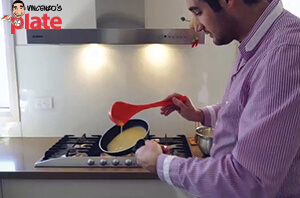 Using the deep scoop, fill it up with the crepe mix around half way and hold it in your hand. 23. Using your other hand, pick up your saucepan by its handle and pour the mixture while helping it to spread around the pan by rolling it around in a circular motion on an angle. 24. Do not pour the mixture into the middle of the pan as it will make your crepe too thick. 25. Wait at least 10 -15 seconds and using a fork, check the sides of the crepe at the top to see whether it has begun to cook through. 26. If it has, peel back one corner of the crepe and then keep peeling using your hand and flip the crepe over. 27. This now needs to cook on the other side for at least 15-20 seconds. 28. Your first one will be a test and if it is cooked through, repeat this procedure leaving the crepe in the pan for the same amount of time. 29. The cooking time will always depend on how hot your pan is. 30. If it is cooking too fast, turn down the heat slightly for a better result. Your crepes can be used to make Cannelloni, Lasagna or even baked crepe dishes with vegetables and sauces of your choice! Remember! 5 x average size eggs = 100g flour so add from there!